09.03.05: Fording the Secesh River - BRRRR! 09.04.05: Ahh Loon Lake, the Dragon Bomber awaits! 09.04.05: We found it! 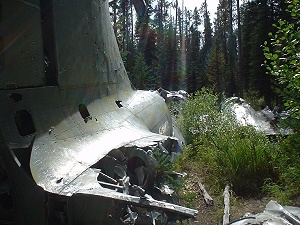 The downed WWII B-23 Dragon Bomber that is. 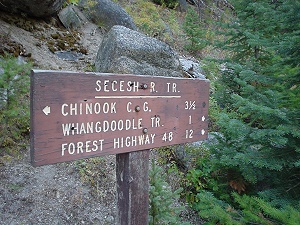 Secesh Hot Springs lies way above the Secesh River and requires a quarter mile, near vertical hike to reach after the river ford. Hot water from the source flows directly into the top pool. 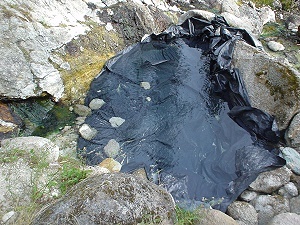 The outflow from the top pool and two other smaller sources fill the subsequent pools below. The 3rd pool from the top (just below the 2nd) isn't warm or deep enough for a soak. The last and lowest pool; located all the way down by the Secesh River features frigid, stagnant water. Something remarkable to note: the hot springs water is among the softest I have ever experienced - my skin felt amazing after soaking, not dry at all. 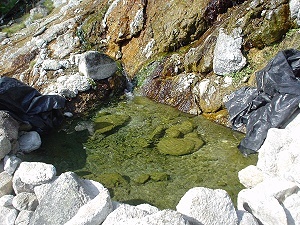 It should also be noted that the infamous Red Spider Mites inhabit this hot springs as well. Please tread lightly as this area is heavily impacted due to the nearby popular Loon Lake loop hike, bike or motorbike. All pools feature rock walls, gravel and rock bottoms and are at most 3 feet deep and 6-8 feet wide. They will require revamping and cleaning upon arrival because of their low use. We made used the tarps left in the pools (we removed the tarps upon arrival, cleaned the pools, preformed light patch work on the rock walls, then replaced the tarps before soaking) and removed them again before leaving. 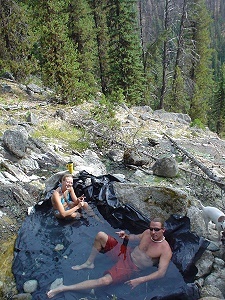 Please always remove tarps or plastic when leaving the hot springs. The pools were full of algae and goobers due to low usage. 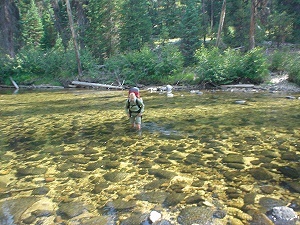 Fording the Secesh River limits access to this hot springs until late summer, usually starting mid to late July until the snow falls (anytime between Sept.-Nov.). Winter access could be possible with a snowmobile (to the TH) and snowshoes to the hot springs; but fording the river would prove crazy this time of year. There's 1 fairly large and semi-flat, grassy campsite next to the river way below the hot springs. There is no camping up-top near the hot springs: no open or remotely flat space. Please use the existing primitive camp; there's no need to create another campsite. 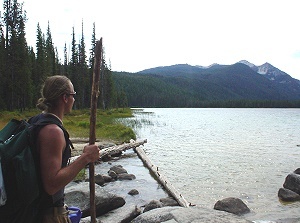 There are other primitive camping opportunities near and at Loon Lake and at the trailhead campground. 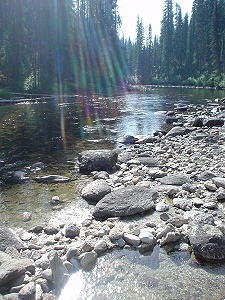 A little reworking has taken place at Secesh Hot Springs, northeast of McCall, Idaho. Smaller pools have been disassembled in favor of a larger primary pool. Initial qualifications have been favorable. Our 3-day backpacking trip to Secesh Hot Springs was a blast! 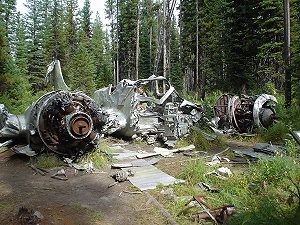 In addition to the hot springs, we also hiked out and around Loon Lake among the horde of day hikers, mountain bikers and motorbikes to the wreckage of a downed WWII B-23 Dragon Bomber that crashed on January 29, 1943. Everyone survived the crash and following ordeal - according to the historical sign; which didn't help the credibility of my (made up) ghost story of the Bomber crew walking the trails at night. After fording the Secesh River we left the crowds behind, our packs at the primitive campsite and headed up the steep mountain side to the hot springs. That was quite a hike; much more difficult than the 4 mile hike in. 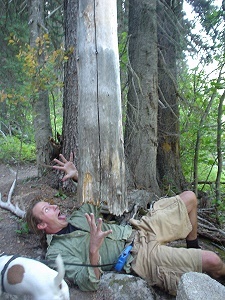 The near vertical hike is a maze of faint trails blocked by downed trees and slides. We cleaned up the algae and goober laden pools and enjoyed many grade A, perfect temperature soaks. A slight detraction was the presence of Red Spider Mites.